AFTER five years of being tagged as a leader of a local crime syndicate, Jason Cabrera still refused to be arrested by the police. Last Saturday, he ran from them, leaving P6 million worth of shabu packs and three guns in his home to be seized by operatives of the Criminal Investigation and Detection Group (CIDG) 7 in Barangay Cogon Pardo, Cebu City. “Marunong kaayo iyang balay, duna’y (His house is extremely syndicated, designed with a) secret door!” recalled Senior Insp. Delfin Bontuyan, chief investigator of the CIDG 7, to Sun.Star Cebu. Cabrera, who remains free, reportedly jumped through a small hidden door below the air-conditioning unit of his bedroom when he noticed policemen treading the bamboo bridge near his house. The detectives were there to implement a search warrant issued by Regional Trial Court Branch 10 Judge Soliver Peras in the house of Cabrera, who has long been tagged as a level-two drug pusher. Cabrera makes P6 million to P12 million in weekly sales of methamphetamine hydrochloride, locally known as shabu, as distributed by his “men” across the cities of Talisay and Cebu, according to Bontuyan’s three-month investigation. “Daghan kaayo na siya’g bata-bata (He has a multitude of henchmen),” Bontuyan said. The CIDG team, led by deputy chief Fermin Armendarez III, had to figure out in at least three months how to penetrate the den of Cabrera and arrest him in a single operation. Bontuyan said there was no other way to get to the suspect’s house but to pass through a hanging bamboo bridge atop a river canal, since the community in Cogon Pardo is located near the seashore. Passing through the bridge, as it turned out, also did not led to Cabrera’s arrest because the suspect has implanted a mirror on one side of his house. The mirror shows him a view of the bridge and the people passing through it. Cabrera reportedly has henchmen discreetly guarding the bridge, too. These people are now under monitoring. “Naa na siya’y sweldado nga tawo 24/7 nga igsu’d pa lang nimo, kon bag-o ka’g nawng didto sa taytayan, tawagan dayon siya (He has henchmen guarding the bridge in every hour, even at night, to phone call him when a stranger passes by the bridge),” Bontuyan said. The door was locked when the detectives arrived. Bontuyan tried to ram it with a tool. When the door opened, dozens of shabu packs were scattered in the floor leading to the bedroom of Cabrera. Tools needed to re-pack and sniff the illegal drug were also on the floor. Cabrera will face complaints for violating Republic Act 9165 or the Comprehensive Dangerous Drugs Act of 2002. Once caught, he will face 40 years of imprisonment. The operation was part of the CIDG 7’s Oplan Paglalansag Omega, a campaign against loose firearms, and Oplan Big Bertha, a campaign against illegal drugs. In Mandue City, the security guard of Ceres Bus turned over a duffel bag containing about four kilos of dried marijuana leaves. The bag was reportedly abandoned by one of the passengers of a bus bound for Palompon, Leyte last week yet, Police Senior Insp. 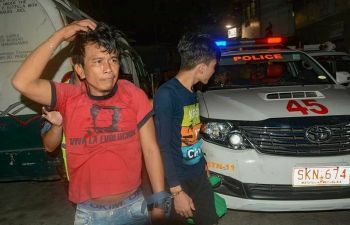 Janelito Marquez of the City Intelligence Branch of the Mandaue City Police Office said in a phone interview yesterday. Marquez said that based on the guard’s account, the bus conductor of Ceres Bus 8404 found the bag and brought it back to Cebu City, thinking that the owner would later claim it. But after one week, no one came to their office to claim it, prompting the guards to inspect the bag. “The bag has a hole and they saw that that there are dried marijuana leaves inside. It weighs about four kilos and is valued at about P220,000,” Marquez said. The contraband was turned over to Station 2.